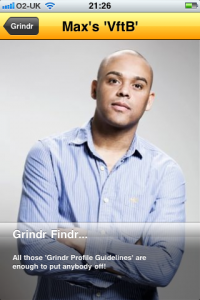 Grindr Findr… & All That Jazz!? Today, a friend posted an article about Labour’s Chuka Umunna MP and comments he made around 2006 on a social networking site for ‘wealthy’ people. Since I started blogging, I have often been critical of the Coalition Government (the Conservatives and Liberal Democrats) and indeed Labour. None of the parties are perfect, hence the reason I’m a member of none. The article in The Telegraph via The Daily Mail attacks Chuka’s views on ‘trash’ (people), as if any of us should be surprised. The reason so many of the ordinary citizens are so disengaged with politics is because, how many politicians actually represent the people? I mean REALLY represent the people. I tweeted only the other day that, 23 members of the British Government are millionaires. Why should we expect the background of all Labour politicians to be any different, from those of their Tory and Lib Dem peers? If I’m right, I’m sure Ed Miliband, David Cameron and Nick Clegg all have similar backgrounds too. The fact that ‘some’ are so desperate to dig-up things in the past, to try to harm someone in the present and future. The story isn’t about the Shadow Business Secretary’s comments, or indeed that he may be a millionaire (like so many Tories). It’s about the fact that in Britain, we go out of our way to find ‘sensational’ stuff to harm our fellow countrymen. In many respects, we are a World Leader in this. I would love to see the ‘perfect’ lives of those, who do the investigating and storytelling. This type of sensationalism has been a HUGE problem within the gay community, and why so many people like me won’t challenge wrongdoing or step out of line incase ‘something’ (not even illegal) from their past is brought-up. In essence, being held to ransom. The past couple of years I’ve found myself in many coffee shops, with one thing or another. And, as an ‘out’ gay man, I like to keep abreast of things happening within the LGBT community and elsewhere. A big thing to hit the gay market of recent times is the smart phone applications specifically for ‘my kind of people’, and one of these is the social app Grindr. I think there is an equal straight version ‘Blendr’, which I told one of my female friends to look into. The iPhone and Android have changed the way we live our lives, and interact with one another. Long gone seem the days when we could only meet and chat to people in bars, clubs, theatres, museums and galleries etc. Now with social networking, you can be having a conversation with one person on your mobile device whilst on your way to meet another – it’s that advanced. But, I know so many guys (friends and acquaintances) that are so scared of saying something wrong or acting in a non-conventional way (whatever that is) – with the fear that, it too will be used against them in the future. I can see where they are coming from though. After I became ill through discrimination within the Metropolitan Police, both it and The Sun newspaper tried to dig-up things on me and discredit me. Hoping I guess, I would stop my challenges against the Police Commissioner. They miscalculated one BIG thing though. I am beholden to no man. The only person I feel I would have had to explain myself to, is My Mum. Because, I wouldn’t want her to be upset regardless. But sadly, she is longer on this earth. The Sun could have and can still write, picture and post whatever it wants about me. It is then my right, to challenge that information in a Court of Law. Breaching my privacy, is NOT up for negotiation. I know it’s easy for me to say, but we should never allow others to have some sort of grip on us – that, we cannot live our lives and be who we really are… it could simply be, being out and happy as a gay man. Several years ago, where would these guys who are on Grindr now be? Does social networking allow us to be more free? Grindr like everything in life, is meant to be fun. It’s what you make it. It’s sad that even in 2013 people feel they have to hide their sexuality, or cannot express themselves properly. My first book Broken looks in detail at the lengths both Scotland Yard and The Sun went to try to harm me and my reputation, Grindr being just one of those. I’ve said it often, but I can’t remember either setting the standard for morality. Who are you to judge the life I live? I know I’m not perfect, & I don’t live to be, but before you start pointing fingers… make sure your hands are clean! And from me… NEVER let anyone think who and what you are is wrong, that was my mistake. If you’re gay, be PROUD. I don’t mean ‘shouting it from the rooftops’ (although, you can if you want), just be happy and ENJOY life. As long as you are not hurting anyone, who are others to judge you especially the two organisations above. Who frankly, need to get their own houses in order first before preaching to others. This has been a… Happy Grinding, ‘View from the Bottom’.